The new camera 1 not only has a higher resolution, but it has a better night-time performance. Bella (or at least it very much looks like her) was sitting on the tower again today. 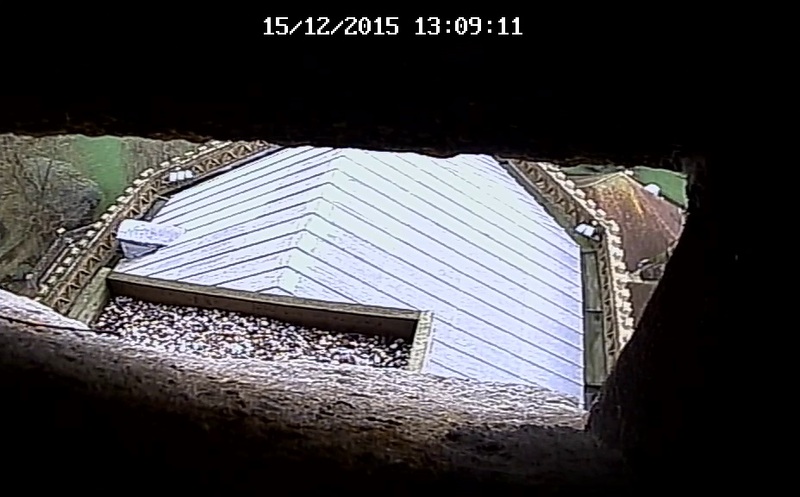 She was on her usual ledge on the east side of the tower, just a little bit above the nesting tray. 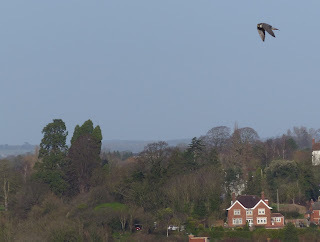 Having climbed to the top to the tower to view the floods, I did manage (just) to take this photo of her flying off. The water is up a bit at the moment. These two seemed to be happy swimming on the Swilgate River, even though there are a few more places to swim than usual. Not only has camera 2 been installed, but I have also replaced camera 1 with a higher resolution one. This has also been mounted closer to the tray. Luckily, a passing Columba livia domestica was on hand to test it out! There was one bird to be seen this morning perching in the usual place on the East side of the tower. Judging by the size, I think this is Bella. Camera 2 is now up and running! Hopefully there will be a bird for it to see soon! 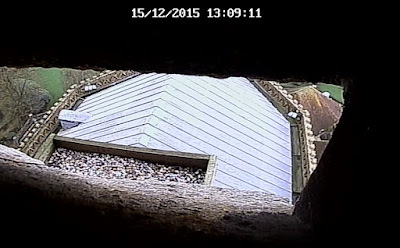 The nesting tray has been serviced, closing up the gap between the planks, and a layer of new gravel has been provided. All we need now is a pair of peregrines. I did see Bella on the tower twice last week (but too dark to photograph), but Christopher Robin hasn't been seen since September. This is nothing unusual as he was not to be seen at this season in previous years. I don't know what bird has triggered the camera - all you can see is his tail and feet!